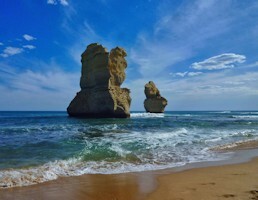 The Great Ocean Road would be one of the most toured routes along Australia's impressive coastline. Make the most of this stunning scenic drive and spend three nights at the popular coastal townships of Warrnambool, Port Campbell and Apollo Bay. Whether down the Gibson Steps or flying high in a helicopter, the views of the Twelve Apostles and Great Ocean Road will take your breath away. 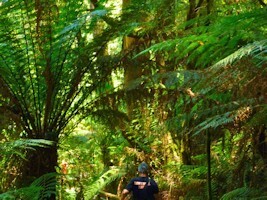 Stroll amongst the giants on Australia's longest Tree Top Walk in the Otway National Park. 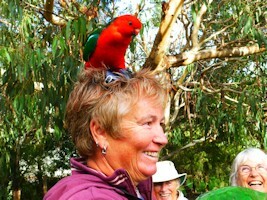 Gaze up on koalas snoozing in the gum trees and hand feed king parrots in the wild. Witness the Twelve Apostles sunset with your own eyes, taste local wine and cheese and watch the engaging light and laser show at Warrnambool. Explore the Naracoorte Caves, South Australia's only world heritage site and cruise to Seal Point alongside playing seals and spectacular cliffs. 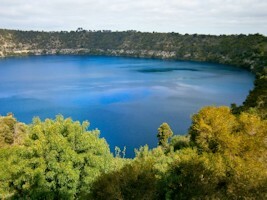 Tour Mount Gambier for a day taking a glass panelled lift down to the Blue Lake, walk down to Umperston Sinkhole and watch the Cave Garden by night. 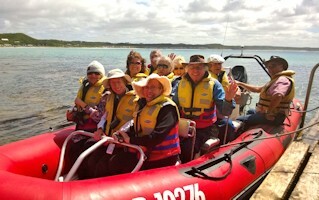 Day 1 Depart Adelaide on a wonderful tour to Mount Gambier, Cape Bridgewater and the incredible Great Ocean Road. Famous for its breathtaking scenery, with a coastline of giant cliffs, idyllic coves, wide beaches and sand stone pillars known as the Twelve Apostles. 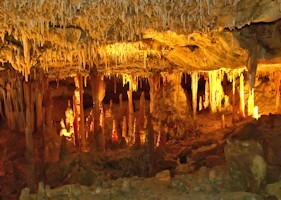 Today our first stop on route takes us to Naracoorte, home to the Naracoorte Caves, a world heritage site in South Australia. The caves have an extensive fossil record teaching us the history of the past half a million years. We embark on a tour into the Victoria Fossil Cave and top it off with a visit to the spectacular Alexandra Cave full of geological treasures. Then it is onto Coonawarra wine region, situated on a bed of limestone with terra rossa soil and pure underground water. Enjoy a structured wine tasting at Wynns Coonawarra Estate before our final stretch to Mount Gambier. We get settled into our accommodation for the next two nights and join back for a delicious dinner. Day 2 Today we have a full day to explore the features of Mount Gambier which made this town a popular tourist destination. The Blue Lake is a large crater lake in an extinct volcano and changes colour throughout the year. Firstly we take a glass panelled lift down the original dolomite well shaft and walk through a tunnel to see the Blue Lake in close proximity. It is not only the lake that attracts so many visitors, Mount Gambier is like "Swiss Cheese" beneath the ground, a myriad of caves and sinkholes in the soft limestone ground. Discover the beautiful terraces, ferns and curtains of ivy in the Umperston Sinkhole, great photo opportunities from down below and from above. Once back on higher levels we take you to Lady Nelson Discovery Centre to soak up the history and stories of Mount Gambier before dinner. 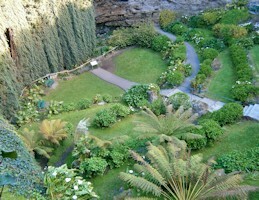 Once the daylight is coming to an end we make our way to the Cave Garden located in the centre of the town. The deep sinkhole is home to a beautiful flora and popular for the colourful sound and light show at night. 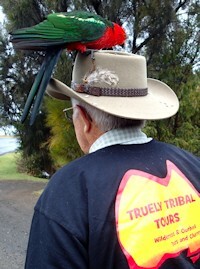 Day 3 We leave Mount Gambier by 8.30 am and travel to Cape Bridgewater for a truly amazing cruise at Seal Point. Watch the seals playing around you and showing off to the sound of clicking cameras. We cruise alongside stunning high cliffs, rock platforms and into Watery Cave, an amazing experience with a very knowledgeable guide. After lunch we continue our journey to Tower Hill Reserve, nestled inside a dormant volcano. It is a beautiful haven for koalas, emus and kangaroos. Visit the local Worn Gundidj Centre with cultural displays and authentic indigenous products. 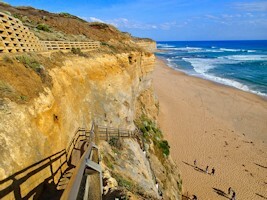 We travel onto Warrnambool, a city situated on the majestic and rugged coastline of Victoria's Shipwreck Coast. Enjoy a little rest or walk around town before dinner. 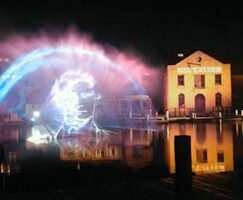 Tonight we experience the seafaring history during a spectacular Sound and Light Show at Flagstaff Hill. Day 4 Enjoy a little sleep in after last nights entertaining show. Well rested we have another great day ahead with plenty of time for walks and photographs along the world famous Great Ocean Road. On route we stop at Allansford Cheese World for morning tea with delicious scones, cream and jam. But it is not only the cheese that brings us here. You can view a great collection of butter stamps, milk bottles, cheese hoops and a range of early milking machine accessories in the museum part of this factory. Top it off with browsing through the souvenir shop or perhaps buy your favourite cheese for later on. 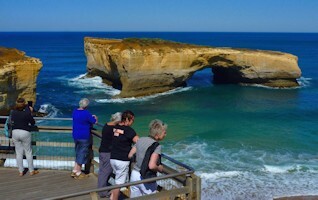 Continuing our journey we travel to the Bay of Islands, the first impressive part of the Great Ocean Road Drive. London Bridge was once connected to the main land and is now one of the most photographed icons along the coast. Short and easy walks give access to London Bridge viewing areas. Our final destination is Port Campbell and we check in at our accommodation after lunch. 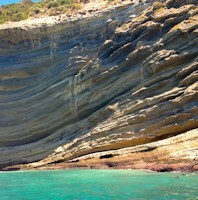 Once replenished and rested we travel to Gibson Steps, take the steps down to the beach below and be astonished by the 70 metre high vertical cliff line. Be humbled by the sheer scale of the two offshore stacks, Gog and Magog. If the many stairs are not your cup of tea, enjoy the amazing views from the well positioned viewing platform above. 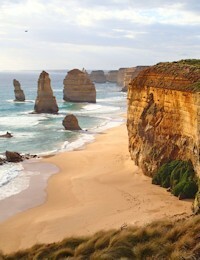 The Twelve Apostles are the most breathtaking and famous offshore stacks along the Great Ocean Road. We will stay for sunset and watch the rock colors changing every minute. 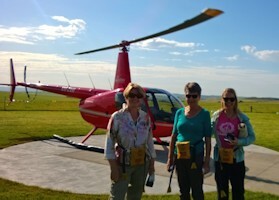 Day 5 Not a too early start today and we head to the information centre and take a scenic flight over the Twelve Apostles, Port Campbell, 2 Mile Bay, The Arch and London Bridge. Enjoy an informative commentary on the unique rock formations and history of the Shipwreck Coast by the experienced pilots. We leave this part of the coast and wind our way to the Otway National Park, which represents ancient rainforests, fern gullies and huge tall trees. Explore the popular Tree Top Walk, a purpose built steel structure leading a walkway through the treetop canopy. After lunch and two exciting activities up our sleeves, we drive to Apollo Bay. Spend the afternoon with a relaxing stroll along the beach or check out some of the local stores in town. We join back together for dinner and a well earned sleep. Day 6 After breakfast we travel a short scenic drive to Kennett River where we can see koalas and many colourful birds in the wild. With a bit of luck you will have King Parrots sitting on your hand, fantastic to watch them up close and certainly a great photo opportunity. Our next stop takes us to the seaside township of Lorne. Walk along the picturesque jetty and enjoy a hot cup of tea or coffee before heading off to the Memorial Arch of the Great Ocean Road. The Memorial Arch is a tribute to the World War One servicemen who built this incredible road with a length of 243 kilometres. Our beautiful tour is coming to an end but not before a delicious wine tasting and lunch at Shadowfax Wines. View the underground barrel hall and listen to the live music over lunch. We drive the last leg of our journey and arrive in Melbourne early afternoon in time for sightseeing, souvenir shopping or perhaps to join the penguin express to Phillip Island.